An emotional Barbora Spotakova of the Czech Republic says it felt "so easy" to regain the javelin world title she first won 10 years ago at the world championships. 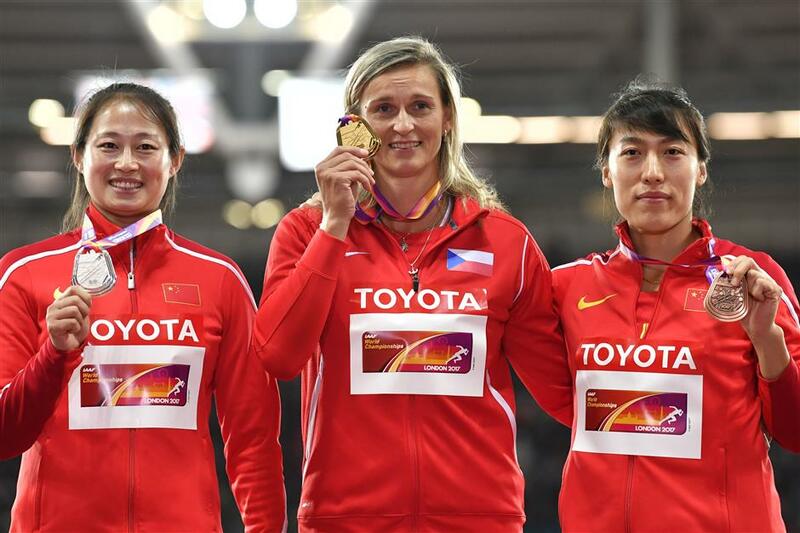 From left: Runner-up China's Li Lingwei, gold medalist Czech Republic's Barbora Spotakova and bronze winner China's Lyu Huihui pose on the podium during the victory ceremony for the women's javelin throw at the world championships in London on August 8, 2017. An emotional Barbora Spotakova of the Czech Republic said it felt "so easy" to regain the javelin world title she first won 10 years ago at the world championships on Tuesday. The world record holder threw 66.76 meters on her second attempt in the final at the London Stadium, which proved enough to clinch a second world gold for the 36-year-old. In the same stadium where she won the second of her Olympic titles five years ago, a jubilant Spotakova was lifted aloft by a member of her team following her final throw. "At this stadium, I am unbeatable. There must be something in the air about London. I cannot explain it but when I enter this stadium, I always feel so calm and relaxed. I believed I could really win it today, I was so focused and confident," she said. "The whole day I was thinking about my last world title which was 10 years ago in Osaka. Actually, it is also almost exactly five years since my Olympic title here in London. "These facts made me feel very emotional and I could not believe it has been already such a long time ago. I do not even know if I deserve this title today, it felt so easy." Although she did not come anywhere near to her world record mark of 72.28, it was a vast improvement on the previous year for the Czech who took bronze at the Rio Olympics. Sara Kolak of Croatia, the Olympic champion, missed out on the medal places by finishing fourth. China's Li Lingwei, twice Asian champion, threw a personal best of 66.25 to clinch silver and her compatriot Lyu Huihui, who came second in Beijing two years ago, claimed bronze with her penultimate throw of 65.26.